You can earn 60 yards with this purchase! Shows some visible signs of limited use, but is in fantastic shape and has been exceptionally well maintained. If you look really close, you may see some minor or faint cosmetic blemishes (e.g., very light scuffing and/or scratching), but overall, the luster of new is still very much alive. 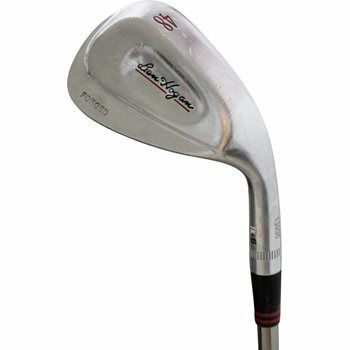 The Ben Hogan TK wedge has been completely re-engineered to distribute weight evenly across the back of the clubhead to deliver more penetrating ball flight on full swings, more forgiveness than any other wedges, and better distance control on all shots. Each loft has its own specific weight distribution to optimize performance effectively delivering a low launch and high spin combination. Additionally, each TK wedge has its own blend of a high-bounce front section with a low bounce main portion to handle any lie. CNC-milled faces and grooves maximize shot shaping and spin performance. V-Sole Technology - precision blend of a high-bounce front section with a low-bounce main portion to handle any lie or shot you might face. Review by pa, 26 days ago. Review by Brian S, 1 year ago.